Awards are issued each month for members and their Family. 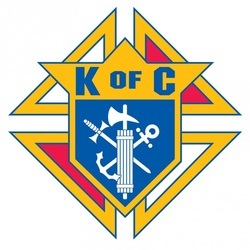 Each month the Knights of Columbus select a worthy brother knight and a family to honor for their hard work in the community and church. ​Golden Knight of the Year - Br. Chip Mulvey - 2018. Rookie of the Year - Br. Mike McDonough - 2018. ​ Knight of the Month - Mike McDonough - March 2018. Henry M. Olszewkski - Honorary Member 2017 and for life. ​Family of the month - SK Henry Winbush - January 2017. Family of the year 2016 - Ed Boto Family. At the State Convention in Winston-Salem, NC held on 21 May 2016, Council 2838 received the NC State Circle Squires Award for Keep Christ in Christmas card sales, held here by GK Frank Pollak. ​Family of the Month Award - May 2016 - PGK Jerry Fonke. ​Programs Award for 2014 - 2015, Council 2838. Knight of the Month for March 2015 - Brian Rose. Family of the Month for May 2015 - Br. David Sherrard. 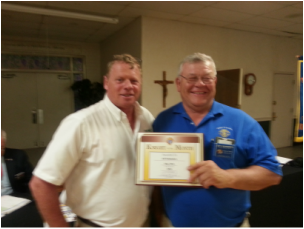 Knight of the Month for April 2015 - Br. Dennis Cahill. Chip received this Certificate of Appreciation for doing a great job in helping keep the Council's financial records accurate.